Spain is a Mediterranean country and like other countries from that region, Spain cuisine is interwoven with tasty and colorful ingredients. Spanish cooking is a cuisine developed under many influences of Rome, Greek, and even Celtic heritage. Besides meat, fish and poultry, Spanish cooking is specific by use of almonds, honey and citrus fruits and these can be found not only in desserts but also in savory meals. Spanish recipes are not so difficult to prepare and to show you the simplicity we have gathered some of the most famous Spanish recipes. 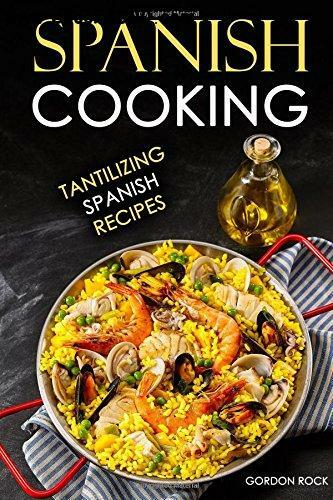 In this Spanish cookbook, you will find recipes for the most famous Spanish dishes and recipes for those that need to become famous. Dive in the world of Spanish cooking with these colorful and delicious meals...pair food with quality wine and while the Spanish guitars are coming from the speakers, enjoy in your own Spanish night.